Bacterial filters are used for several purposes. One of them is to remove bacteria and similar minute particles from a medium. Another purpose is to collect and concentrate such particles. 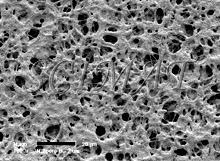 Membrane filters 13 mm in diameter are conveniently used to capture microorganisms for scanning electron microscopy (SEM). There is a wide variety of such filters on the market both concerning the materials and the pore sizes. 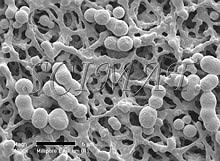 Preparation of microorganisms for SEM involves their fixation in aqueous media such as buffered glutaraldehyde and/or osmium tetroxide solutions and dehydration in a graded ethanol series. Thus the filter must remain stable in absolute ethanol and also in liquid carbon dioxide during subsequent critical point drying. Polycarbonate and some other filters are suitable for this purpose. For SEM, the surface of the filter is also important. Some filters have smooth surfaces interspersed with circular pore openings (Figs. 1 - 4), whereas other filters look like mats under the electron microscope (Figs. 5 and 9). The "smooth" filters have two different surfaces. The top has a somewhat uneven topography (Fig. 1) whereas the bottom side is very smooth (Fig. 2) a has a shiny appearance when examined by naked eye in reflected light. The pores run through the entire thickness of the filters (Fig. 3). If several pores are fused together, the opening through the filter may exceed the declared pore diameter. 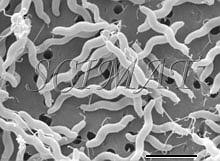 This kind of filter is well suited for imaging purposes because bacteria do not lodge in them if pore sizes smaller than the bacteria are selected (Fig. 4). A brief treatment of the filters with a 0.1% poly-L-lysine hydrobromide solution in many cases improves the adherence of the bacteria to the surface. (Suction was used to collect the bacteria). Floating the filters on the fixative (an aqueous glutaraldehyde solution) for an hour or two before immersing them is also helpful to keep the bacteria on the filters for further processing for SEM. Larger cells such as yeasts are more difficult to keep on this kind of filter during the preparatory steps and they tend to separate from the filters as early as during fixation. The rest may separate, in spite of careful handling, during dehydration and criticial-point drying. The mat-type filters (Fig. 5 - 9) seem to be better suited for such large cells. However, some difficulties have been encountered when such filters have been used. They are the subject of this communication. 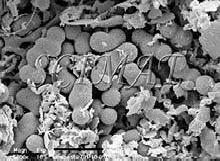 SEM of microorganisms in a garden compost collected on one kind of the mat-type filters revealed some globular structures which have been difficult to identify (Fig. 7). A suggestion was obtained from some experts that the structures could probably have been actinomycetes. 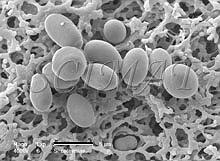 However, when similar structures were also found with Saccharomyces cerevisiae cells (Fig. 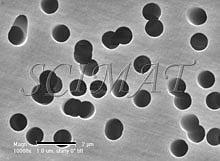 8 - a double globule besides the micrometer bar), a question arose as to whether our microorganisms - or the filters - have been contaminated. SEM examination of unused filters, taken directly from their boxes and subsequently gold-coated, showed that the structures are part of the filters. In some of them they are more common on one side than on the other (Fig. 9). 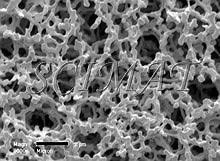 Such structures apparently do not interfere with filtration but may be very confusing when microorganisms collected on them are examined by SEM. 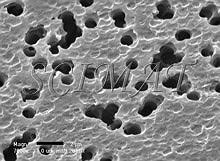 Conclusion: It is advisable to check the appearance of newly introduced bacterial filters before they are routinely used as support for microorganisms destined for SEM. Freeze-fracturing was used to examine the cross-fracture of several Nuclepore filters. The filters would bend rather than break in liquid nitrogen. Freeze fracturing was accomplished by impregnating 2 to 4 filters with absolute ethanol and keeping them stacked on top of each other while keeping them covered with ethanol. The filters were then frozen in liquid nitrogen (ethanol does not form ice crystals under these conditions) and fractured (Fig. 3). 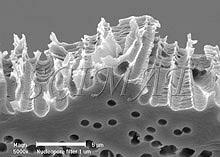 The fragments were critical-point dried from liquid carbon dioxide, mounted on aluminum SEM stubs with the fractures facing up, sputter-coated with gold, and examined by SEM. Please send notes, comments, and criticism for potential inclusion on this page to the author, M. Kalab.